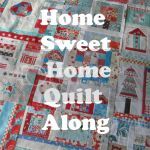 Mini Quilt A Week: Whoo Whoo's cute? Joann Fabrics had this adorable owl fabric. Of course a yard and a half popped into my basket. 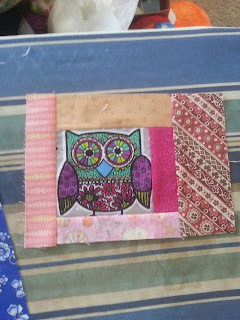 I fussy cut the owls out and cut up my scraps to make wonky log cabin blocks. 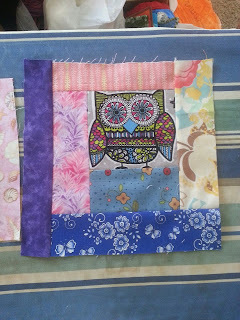 I'm going to make each one measure about 14.5" unfinished so it'll be a really nice size quilt. 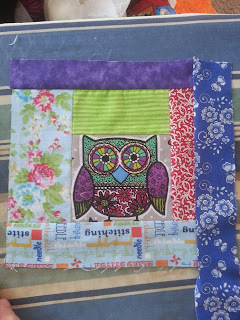 And I'm using up my scraps which will be the best part ever. I have so many scraps I just need to tame them. This should help. Whoo couldn't love those eyes? 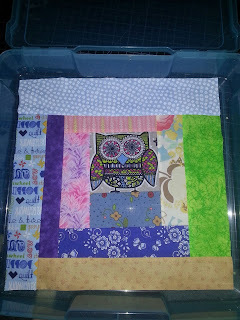 Since there's so many colors in the owls anything goes - the best part ever for using my scraps! !